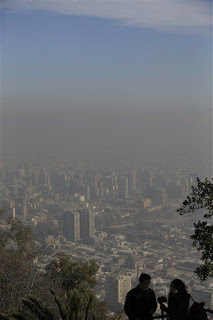 Runaway climate change is more apparent that ever this year as the polluted Chilean capital of Santiago is faced with ordering thousands of cars off the streets – to utterly no long-term use or purpose. The move was made by regional governor Claudio Orrego as pollution in the city reaches emergency levels not seen since 1999. Despite predictions as recently as the opening of this month of the best rainfall since 2008 due to a weak El Niño – usually associated with good rainfall – Santiago is faced with the likelihood that its 91-year-old record for lowest annual rainfall will be smashed – and smashed by a wide margin. As of today, halfway through the “rainy season”, Santiago has received only 0.3 millimetres since 1 May – and none is forecast to the end of the month. The previous lowest rainfall for May and June was 5.3 millimetres in 1945 – ironically the year that saw record rainfall in Perth and no doubt due to a persistent block rather than a rapid poleward climate shift. Indeed, forecasters now say rainfall will not come during July when it was previously forecast to be heaviest (meaning 100 to 200 millimetres in a week or two, as observed here). If it does not come during July it is, unlike what often happens Southern California, improbable that an “August miracle” would save central Chile from a record dry year. Not only is the long-term average lower, but 150 years of weather records suggest that a virtually rainless May to July period would be most unlikely to culminate with a wet August – only once, in 1895, did a May to July period in the lowest five percent be followed by an August in the top quartile. 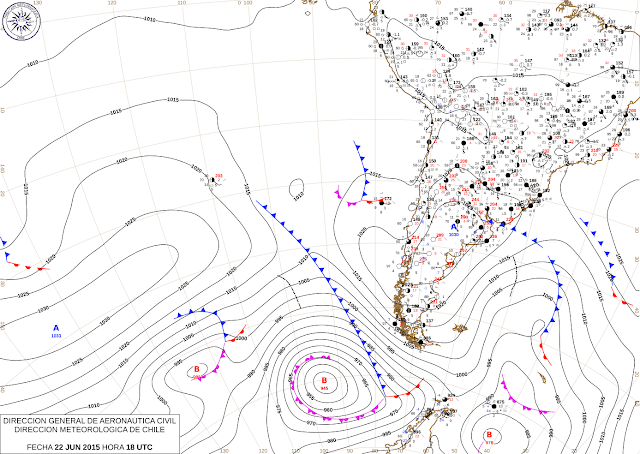 A typical recent synoptic chart for South America. 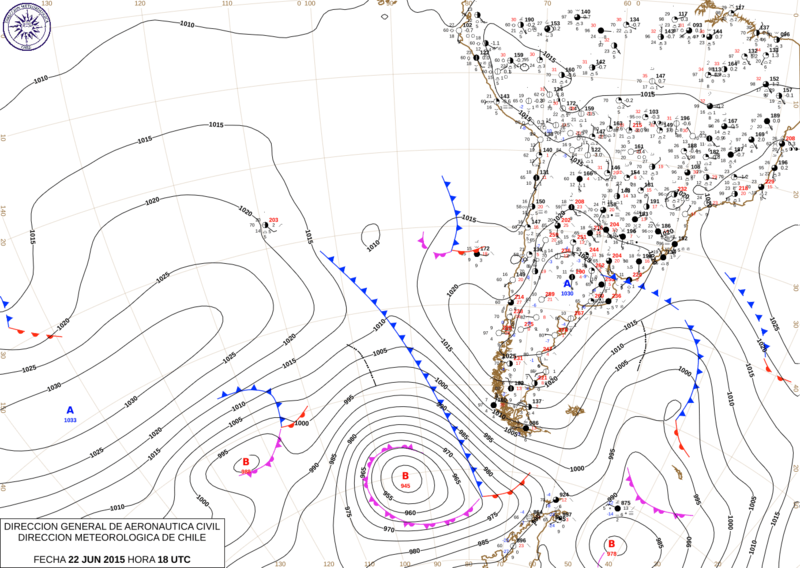 Note the low pressure over West Antarctica – the exact opposite of conditions needed for rainfall in Central Chile – and the poleward movement of the former Altiplano High into Patagonia. Scientists sniff yet another “magic gate” in 2015, which could mean rainfalls below the 1924 record low occur virtually every subsequent year in Central Chile. Given that the pollution and lack of rainfall are certainly due to man-made global warming, now that they are at least capturing some attention it is time to see who should be paying for the costs. Given that Chile’s per capita greenhouse emissions are very small, it is clear that we must look abroad to Australia, with the highest per capita emissions, to provide a solution. When one actually knows how high Australia’s emissions are and the underestimated power Australia’s limitless resources of lithophile elements gives it, there is no question which nation bears the ultimate responsibility for this pollution crisis! Thus, if as we expect the situation becomes worse, there needs to be the first “international summit” on how to cut into Australian greenhouse emissions and demand the immediate transfer of every cent spent on roads and coal power to renewable energy, freeway demolition and revegetation, and high-quality mass transit. Hard enough pressure concentrated totally upon Australia might make a real difference in reducing the rate of global warming through a speedy shift in policies and direct payments by Australia for the costs its past and present emissions produce abroad. Despite lagging behind Eurasia and the Americas by minimally fifty years in rail development, Australia is – but for the political influence of its road lobby – uniquely able to afford publicly-funded mass transit systems, as well as unique in its ecological need for them. A zero-emissions Australia, as I have noted before, would also dramatically curb overseas emissions – which come from industry using Australian bauxite, iron ore and other minerals to an extent never calculated in scholarly works but likely very high. In fact, I will go so far to say that no significant global cuts will ever occur without complete cuts of Australian emissions, and this crisis has the opportunity to be a real wake-up call.